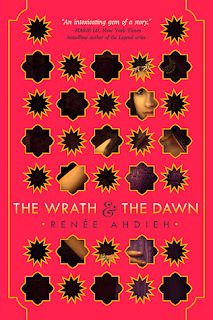 The Wrath & the Dawn is a breathtaking and beautifully written novel. I kept seeing this book all over instagram and I finally decided to check out the audiobook for myself. The physical book is absolutely gorgeous, but I decided to go for the audiobook from the library to make my wallet feel a little better. I was not disappointed. The narrator was amazing and had a beautiful accent and I felt like I was inside the book with the characters. The setting was gorgeous and I found myself wishing I could be walking through the palace and tasting all of the delicious food. The main character Shahrzad is a gorgeous girl who volunteers herself to marry the Caliph in hopes that she will be able to seek revenge for her best friend's death. The reader follows Shahrzad through her trials and tribulations in the Caliph's home and as she reasons out plans to stay alive as well as murder the Caliph. While making my way through the novel, I couldn't help but become attached to Shahrzad. Her strong will and sharp wit made me love her character almost instantly. As Shahrzad begins to learn more about the Caliph, her heart begins to soften. The novel takes a turn when the Caliph and Shahrzad begin to fall in love. As their romance grows, secrets are revealed and the true colors of the Caliph are shown, leading up to a dramatic cliffhanger ending. There are some books that receive way to much hype on instagram but this definitely was not one of them. The atmosphere was so realistic and I felt like I was there with the characters the entire time. I loved The Wrath & the Dawn and would highly recommend in to readers who love the YA genre.